Sodium Nitrite – is it really as bad for me?? Sodium Nitrite is probably one of the most mis-understood ingredients in food processing today. 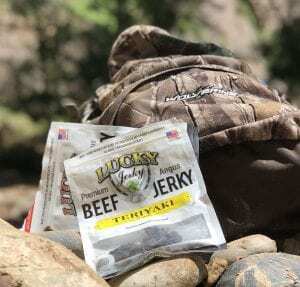 Lucky Brand Jerky produces “All Natural” Jerky by USDA definition, with the exception of 2 sku’s – Patriot Jerky and Survivor Jerky which use traditional sodium nitrite. That said, we do use nitrites in our “All Natural” Beef Snack Sticks to allow them to be shelf stable with a fairly high ~.87 aW (water activity). Our Beef Snack Sticks utilize nitrates that are naturally occurring in Celery Juice. They are chemically the same as man made Sodium Nitrite, but they are from a plant which allows us to maintain our “All Natural” status. Please check into other manufacturers and don’t be afraid to ask this question until you have an answer to your satisfaction. Nitrites are a very, very important part of the food safety equation, but ultimately, it’s up to you the consumer what you put in your body. Sodium Nitrite was first approved as a cure to be used in meats in 1925. Since that time it has been so successful, that many have wondered why we are even using it anymore. Sodium Nitrite is a salt and an anti-oxidant (prevents things from oxidizing) on a large scale, sodium nitrate serves a very important public health role as it blocks the growth of botulism causing bacteria and prevents food spoilage. Sodium Nitrite also aids greatly in preventing the growth of Listeria and adds a unique and very tasty flavor to the meats which it is used to cure…ham & bacon are prime examples. Most people associate sodium nitrite with meat products, and while sodium nitrite is widely used in meat products, it can also be found in a large number of vegetables as well. In fact, almost 93% of sodium nitrite that we consume comes from leafy vegetables & tubers. Did you know that spinach contains on average 1200ppm of sodium nitrate? Radishes contain 1500 – 1800ppm and lettuce can contain from 600 – 1700ppm. For comparison bacon is injected with no more than 156ppm sodium nitrite, by USDA regulation, and the remaining sodium nitrite in the finished product is generally less than 10ppm. Vegetables contain large amounts of sodium nitrate which turns into sodium nitrite when it comes into contact with saliva in the mouth. Less than 5% of sodium nitrite intake comes from cured meats like bacon, ham, or shaved beef, pastrami, hot dogs, sausages, etc, etc. When you hear the term, “Cured Meat” that, by definition means that the meat has been “cured” with sodium nitrite. Sodium nitrite is what gives products like cured ham it’s color and taste. Sodium Nitrate also gives products a much longer shelf life. So what about cured meats that say they don’t contain sodium nitrite? Well, back to the vegetables. Celery Juice is commonly used as a cure because it contains sodium nitrate naturally, which when used as a meat cure, delivers a color and flavor similar to traditionally cured meats. The sodium nitrate in the vegetable based compound reacts with certain bacteria in the meat to convert into sodium nitrite and cures it in a similar manner to the traditional method with very similar results and chemistry. Does sodium nitrate cause cancer…or cause hardening of the arteries?? Numerous scientific panels have evaluated sodium nitrite safety and determined that given sodium nitrite’s track record in preventing botulism that it is not only safe, it is essential to maintaining public health. In fact, The National Toxicology Program, an agency within the Department of Health and Human Services, conducted a multi-year to evaluate sodium nitrate’s safety when used to help preserve foods. They found sodium nitrate to be completely safe at the levels which it is commonly used today. Believe it or not, sodium nitrate is actually being used to help cure vascular problems, and used in treating heart attacks and organ transplants. While we do not use Sodium Nitrite directly in most of our products – only in Patriot Jerky, Survivor Jerky and Celery Juice Powder in our Beef Snack Sticks – we are confident that when we use sodium nitrite or it’s vegetable based equivalent, that we are making the best possible jerky products that are 100% safe, healthy and wholesome for the whole family. So what about Lucky Brand Jerky Slab Style?? Well, we’ve eliminated nitrites all together in that product and we achieve shelf stability by reducing our active water to around .80 aW then using a very high quality package to store the jerky. 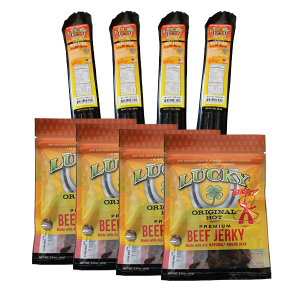 It is important to Lucky Brand Jerky that we produce products that give our customers a choice. Regardless of customer preference, it is our absolute mission to insure that any of these choices can be not only consumed with confidence, but enjoyed each and every time a customer opens their favorite package of Lucky Brand Jerky. Lots of people make their own jerky…but there are a lot of folks who are scared of making jerky. We’re going to dive into this topic to dispel some of the myths about cure, proper cooking (heat treating) and seasoning. 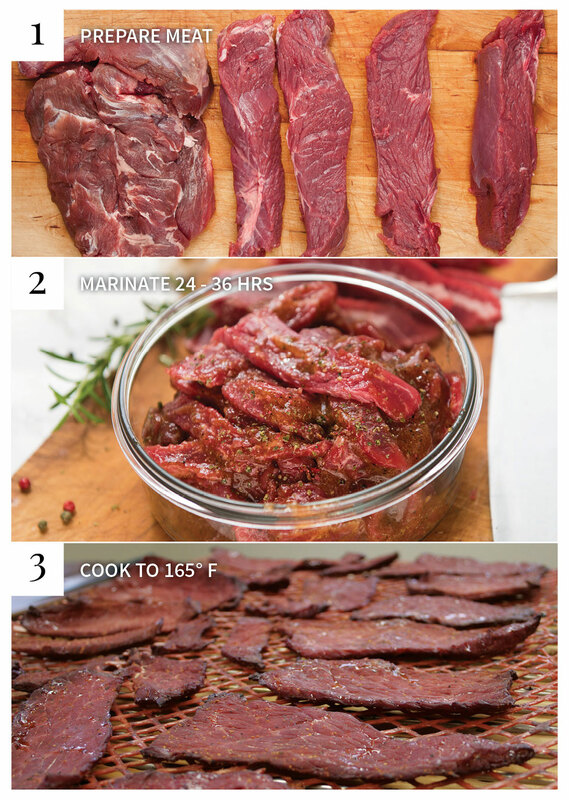 Making a batch of jerky is easier than making a batch of cookies. Seriously. It’s that easy. lean meat, seasoning, cure (sodium nitrite or celery juice powder) knife or grinder, drying racks and an oven, smoker or dehydrator. Slab Jerky aka muscle jerky is the traditional style of jerky that’s been made for eons. It’s very simple to make. Using the Lucky Brand Jerky Seasoning & Cure kit, blend 1 packet of seasoning and 1 packet of cure into a cup or two of cold water and add to 5lbs of meat. Allow the mixture to marinate for a couple days. If you want to add any additional seasoning, this is the time to do it. Adding a little brown sugar to the mix will help keep the jerky more moist. After the meat and marinade have spent a couple days in the refrigerator – between 35 and 39 degrees F – the cure will keep the meat from spoiling. Now it’s time to lay the jerky out on oven racks for drying. (make sure and put some foil down below the meat, as it’s likely to drip as its drying. Cool and enjoy. Jerky will keep for weeks in the refrigerator or at least a few days at room temp. The drier the jerky, the longer it will keep at room temp. Ground and formed jerky is super easy to make and a great way to use up smaller pieces left over when slicing slab style jerky. It’s best to start with lean meat for ground and formed jerky 85 – 90% lean is best, but one can usually get away with 80% lean. We recommend grinding the meat twice, first with a 3/8” grinder plate, then with a 3/16” or 1/8” plate. Once the meat is ground, break it into 5 pound batches for seasoning & cure. Using the Lucky Brand Jerky Seasoning & Cure Kit, dissolve one packet of seasoning and one packet of cure into a cup or two of cold water. Take your time mixing the seasoning in, the better it’s dissolved, the better the jerky will come out. Blend the marinade and meat until the meat becomes very sticky. The big boys call this “extracting the protein” and it’s what allows the ground and formed jerky to stick together nicely. Now it’s time to either extrude the mixture onto drying racks or put it between a couple sheets of wax paper and roll it into approximately 1/4” thick slabs. Carefully peel the top layer off, and use the bottom layer to “flip” the slab onto the drying rack, then remove the new top piece before cooking. Cooking instructions are the same. Cook the meat until the internal temperature is 165F, then cool. If you’re smoking the jerky, make sure and go easy on the smoke, the thin cross section of jerky takes on smoke flavor quickly, a little smoke goes a long way. The process is exactly the same as ground and formed jerky, except instead of laying the mixture out flat, it’s extruded into a small sausage casing and heat treated. while hanging from the top rack. Cooking is the same, go with a low temperature 200F is great, and cook it until the internal temp reaches 165F, then shut the oven down, and open the door so it can cool while hanging. Meat snack sticks take a little practice, but don’t give up, the results are worth the work. If you ever have questions when making jerky, just drop us an email or give us a call. We loving making jerky as much as we love helping people make their own jerky. For the last one hundred years or so Americans have been really spoiled when it comes to food preservation. Home refrigeration hit the market in 1913 and dramatically changed the way that we store food. Even though there have been lots of recent growth in the prepper community which leading to a resurgence of traditional food storage methods like drying and canning, we are still collectively spoiled by technology. Before modern refrigeration or canning, storing food was essential to prehistoric human survival and early humans had limited methods to cure meat. Heat from the sun or fire were the best means available to dry meat were the sun (still a very widely used method in Africa) and fire. Smoke is also used to cure meat, but smoke alone won’t do the trick. Heat treating (cooking) the meat to an internal temp of 165F or a chemical solution (sodium nitrite) is required to truly cure meat and keep it from spoiling for an extended period of time. Jack Link’s helped beef jerky make a very strong resurgence in the convince store market in the mid 1980’s, since then it’s really evolved, and so have the consumers. 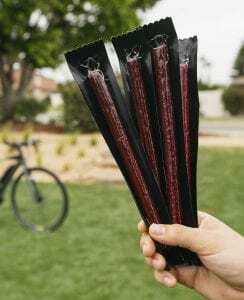 C-Store jerky is now the commodity and a whole new booming craft jerky industry has erupted along with the internet and the ability for lots of companies to successfully penetrate the consumer market. Jerky aficionados know that to get the best jerky, that they are not going to find it in C-Stores. Small Jerky makers who are passionate about what they do are the ones pushing the envelope in today’s jerky market and developing new techniques and recipes that are taking a time honored method for food preservation to a whole new level. Lucky Brand Jerky is among these makers. To this small, family owned and operated business, that has been raising cattle for over 4 generations, traditional meat preservation is nothing new. We make our premium jerky from cattle that we raise right here in central Nebraska and we are experimenting with new flavors and styles of jerky weekly and sometimes daily. We are looking for new, epic flavors and flavor combinations that will allow us to take jerky to the next level. We also offer our tried & true flavors to the public on this website. If you have an idea for a flavor, please don’t hesitate to let us know on one of our social media feeds. We’ve been the best kept secret in beef jerky for the past few years, and we’re going to be working hard to get the word out, especially on our bootleg jerky that we’re cooking up here at the farm.